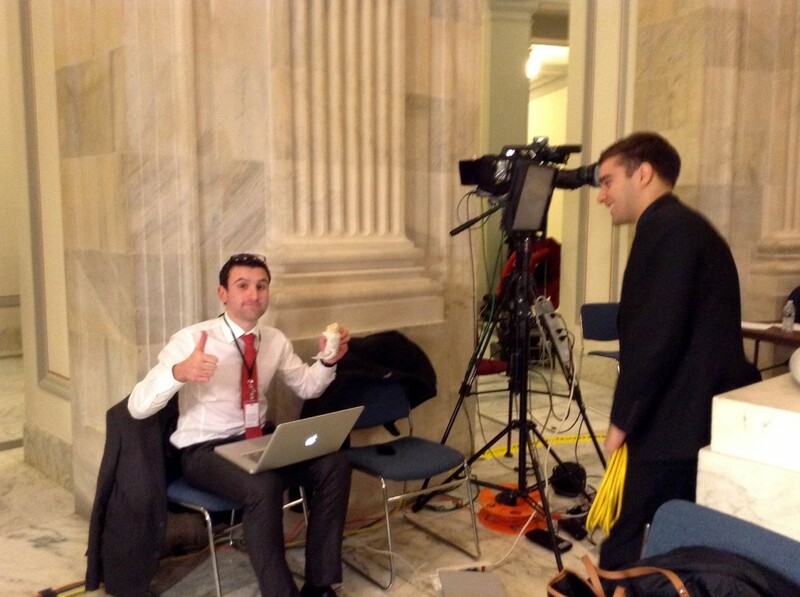 WASHINGTON – Some journalists wait a long time to receive a credential to cover national politics on Capitol Hill. When you get one as a junior year in college – even just for three months – it’s a dream come true. Covering the president’s big night brings perks – randomly bumping into Sen. John McCain; thrills – bomb squad dogs surprising you behind corners; and new neighbors – correspondents of ABC, CNN, Fox, Bloomberg and The Washington Post casually chatting with us. As President Barack Obama delivered his fifth State of the Union address Tuesday, Medill News Service reporters Ryan McCrimmon and I, aided by Soad Mana and Marina Cracchiolo, set up the first live televised coverage of the event for Medill. We broadcast for two Bulgarian channels – Bulgarian National Television, one of the three major broadcasters in Bulgaria, and BiT, a Chicago-based network with a niche audience of a few thousand Bulgarians in North America. As thrilling as it was – stress was there too. We got to Capitol Hill at 5 p.m. — four hours before the president’s speech — to set up at our assigned post: Camera Position Zero in the Senate Russell Rotunda, right in between corespondents of Al Jazeera America and CNBC. This was my first stand-up. Seconds after Obama ended his speech, BiT anchor Yasen Darakov threw questions at me to analyze it – I didn’t even had a chance to review my notes; I translated on the spot and prayed I would not make Medill’s greatest sin – a factual error. Both channels took a risk with a student reporter live on prime television. In the end, they were pleased. This is a story of what stayed off-camera on Jan. 28 – how four Northwestern students navigated security, braved technology failures and bloopers to gather news and enjoy the privilege of being part of the State of the Union media coverage. Wait, first, what is State of the Union? Formally, State of the Union is an annual address of the President of the United States to a joint session of Congress. The president is required by constitution to report on the state of the nation and also outlines his legislative agenda. All branches of government – executive, legislative and judicial – are in attendance. This includes supreme court justices, cabinet members, secretaries and the vice president. To prevent decapitation of the United States government in case of a terrorist attack, one cabinet member and a few senators – designated survivors – are relocated to an undisclosed location. They are sworn to secrecy and briefed on emergency procedures. So, how do you report on such an event? On D.C.’s metro from Medill News Service’s bureau to the Capitol, I kept asking Ryan if we had packed everything. Our bags were stuffed with Potbelly sandwiches and equipment – lots of both. The two of us carried five bags with lights, two tablets (both of which later failed), chargers, a tripod, camcorder, broadband mobile Internet connector, a MacBook Pro, an iPod, cell phones, lavalier microphones, batteries, notebooks, a Dejero Live+ 20/20 Transmitter and lots of cables. We did, of course, forget the most important cable of all – an extension cord. Soad rushed back to the bureau to save us, while I told our CNBC colleagues that we were going to use theirs for an hour. A few hours later, Al Jazeera reporters were relying on us to power their lights. But to report well there is more than just getting all the cables right. You have to keep an eye on Twitter (for breaking stories) and competing media (if they have it, you better find a new angle) and White House updates (like the one below) from the president’s car pool which inform you of his whereabouts and clog your email inbox. State of the Union is a big game where experienced professionals play. In fact, a video journalist from The Washington Post asked Marina Cracchiolo why Medill School of Journalism had a position in the Russell Rotunda and no other school did. Well, it’s because we are better, Marina replied. Truth is, we were newbies. To report as well as veterans who had covered the State of the Union address again and again, we had to do a lot of prep. 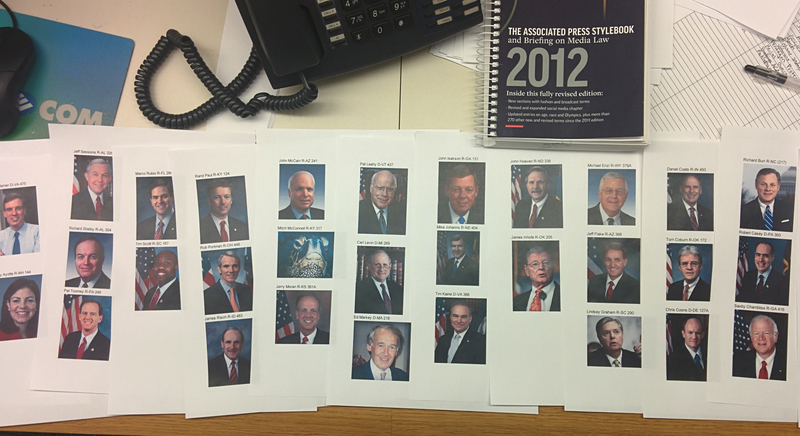 On the picture below are the headshots – compiled by Ryan McCrimmon – of senators with offices in Russell Senate Building. Soad Mana also prepared a list with short bios too. We remembered them all (or tried, at least) – so we could recognize senators, nab them for an interview and ask relevant questions. Headshots of senators with offices in Russell Senate Building. State of the Union is an event on a staggering scale. No person alone could have achieved what we did as a team. When BiT managing director Yasen Darakov called me Sunday to ask for a pre-recorded stand-up, I jumped on the idea of a live broadcast – and he agreed. This wouldn’t have worked out though without a great team. Ellen Shearer and Tom Diemer, Medill News Service editors, thank you for believing us and letting us experiment. Roushan Islam and Jon Agnew, Medill D.C. bureau’s technology backbones, thank you for solving all of last-minute tech whims I came up with – from running to RadioShack to buy an HDMI cable to troubleshooting a buggy iPad. Ryan McCrimmon, a Northwestern News Network sportscaster veteran, thank you for instructing me on how to talk to the camera and shooting liveshots which made me look so great. Soad and Marina, thank you for so many things that made a difference – like running for a power supply and feeding me with great quotes. Last but not least, Rosen Tsvetkov, Yasen Darakov and your teams, thank you for trusting us and getting us live. Sixteen other of the Medill’s finest reporters provided too in-depth State of the Union coverage from various angles – graphics, social media reactions, policy analysis on education and healthcare and color stories. Check their work on the Medill on the Hill website!